Stuff happens—even to good institutions like yours. 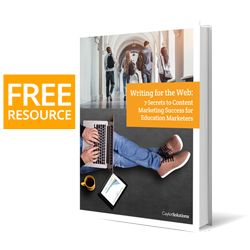 Do you know what you would do in your school marketing to defend your education brand during times of crisis? At Caylor Solutions, we work closely with private colleges, universities, and schools to promote their educational brand, reach more prospective students, and improve their fundraising results. And in doing so, from time to time, we help our clients navigate their marketing efforts in the middle of a critical moment in their history, a massive change in leadership, or even, moral failure. For these times, it’s good to have a well-thought-out plan that helps your school marketing and development staff move forward in spite of the chaos. From my experience, most public relations firms agree with me on this. Some go so far as to have their clients draft pre-written responses to typical tragedies, changes, or scandals. With that said, for this post, I just want to touch on some issues that arise during these decisive times in regards to school marketing and defending your education brand. Understand what a “crisis” is. When we think of a public relations crisis, we’re inclined to think of major scandals like Jerry Sandusky at Penn State or Larry Nassar, a former sports doctor at Michigan State. But the idea of a crisis goes beyond moral failures. For marketers, the term “crisis” should mean any kind of major change or decision, both good and bad. Not just scandals or breaks of trust. Any change can evoke fear or suspicion. A change of presidents. Retiring a long-held policy. Cutting an academic program. Any one of these changes has the potential to create negative brand perception for your school. By expanding your definition of what a crisis is, you can jump into action to assure your audience of the benefits or sound logic of the decision before your institution’s actions can be misinterpreted. With this in mind, any public-facing administrative, facility, policy or financial change should be accompanied by a well-executed marketing strategy to try to head off any potential negative reactions to the news. Teach & enforce corporate values. An ounce of prevention is worth a pound of cure. Your corporate values should be more than a list of virtues on a piece of paper. Your school values should be obvious to those on the inside and outside of your school by the actions of your staff, faculty, and (as much as possible) students. As an education marketer, I can’t tell you how to lead your institution to that level of organizational integrity. But I can say as a marketer that it’s important that you live out your brand values as an institution. This is the hard leadership work that creates brand authenticity, a necessary ingredient to marketing success. Everyone—faculty, staff, and students—needs to represent the brand well. In a way, we’re all in marketing! In most cases, when your education brand is being questioned, or there are massive changes happening, put the brakes on any new marketing initiatives. Especially long-term campaigns that depend on audience engagement and response—like capital campaigns. I highly recommend that the campaign committee, or you as the marketing team, take some time out to reevaluate where your brand stands with your audiences. What kinds of questions are they asking that need to be answered first before you embark on this initiative? What fears or doubts need to be laid to rest before launching your campaign? What brand distinctives need to be bolstered or rebuilt in the minds of your audience before you begin your new initiative? Focus on listening, healing, and restoring. Education marketing at its best is like a conversation. You’re listening to your audience’s questions, and you’re bringing them answers. But during times of change, you have to listen even more. The very act of listening is in itself sending your audience the message that you care. Conduct focus groups. Respond to comments on social media in positive, yet discreet tones. Make improvements where you can based on feedback. Report on progress made based on your audience feedback. Change is hard for your audience, but listening is a tremendously effective way to bring your audience closer to you through your marketing messaging during the transitions. Total, ongoing silence is not an option for education marketers. In today’s connected, highly-informed world, you may not be able to control what everyone’s saying about your brand—but you must be your school’s advocate through your marketing. For help with marketing strategies that build your education brand, get ahold of us today!